A bolt of bright light shot out. With St. Michael the Archangel in the lead, his red cloak flowing behind him, a choir of angels on either side of him, and completely surrounded by the angels and the brilliant light, the Queen of Heaven and Earth, of all the Angels and the Saints, my Mary, made her way back to earth one more time. The children saw what they thought was a flash of lightning streak across the sky. They were sure it meant that rain was coming. But it was followed by complete silence. No wind, not even a breeze broke the calm and quiet of the moment. They were confused. There were no clouds in the sky. But it must have been lightning. They had better get the flock to safety. Another burst of light flew by them. They couldn’t move. 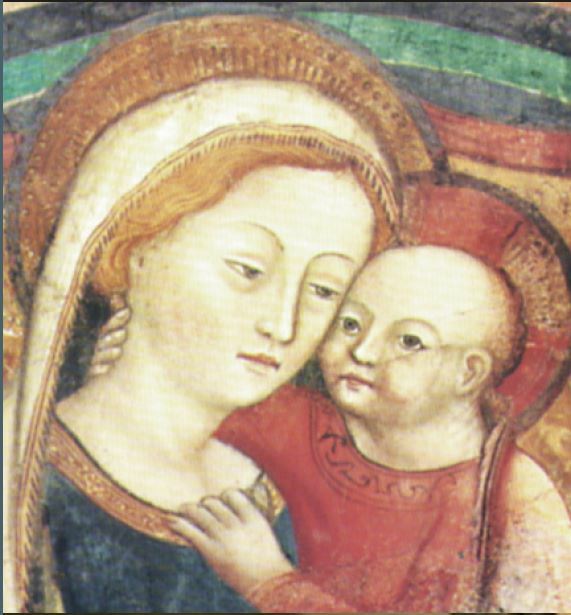 To anyone analyzing the visits of Our Lady to earth, it becomes immediately obvious that she had an urgency this time that we’ve never seen before. On that first day, she gave these little children, who could not possibly understand, HER KEYNOTE MESSAGE OF FATIMA. Everything she wanted to communicate to the people on earth was touched on in that first apparition. Our Lady answered “I come from Heaven”. Then she pointed to the blue skies above. Lucia then asked about two girls who had died recently in her village. One was in heaven, and the other in Purgatory, Our Lady told her. Lucia described what happened next. Enough! Our Lady wanted to tell them all that she would share with them over the next six months, but knew that she had better stop now. After all, this trio consisted of a 10 year old, an 8 year old, and a 7 year old. How much could their little minds absorb? The Lady from Heaven slowly ascended. The bubble of light enveloped her; she moved slowly to the east, back to from where she had come, and finally out of sight. The children watched until there was not a sign of her left in the sky. On their way back to their homes, they made a pact that they would tell no one about what they had seen. There was no way that this would happen, however. They were so filled with joy, they were about to burst. Lucia was able to maintain the discipline they had vowed to keep. Francisco went off by himself to try to sort out what had happened. Keep in mind that on this first apparition, he did not see the Lady. He saw the light, and knew that something important was happening. On the way home, he heard Lucia and Jacinta talking about the most beautiful lady, but he had not seen anything. Jacinta, for her part, might just as well not have made any promise. First off, she looked for her mother, who had not as yet returned home. Determined to tell her as soon as she saw her, Jacinta waited became the brunt of very cruel jokes. Adults, whom they had looked up to, yelled at them, and cursed them. The locals were annoyed with the visitors from all over Portugal, who were descending on their quiet village, and creating such a commotion over these “little brats”. Lucia went through a particularly bad time. Her Parish Priest had a meeting with her. He all but convinced her that it was not Our Lady from Heaven who was visiting her, but the devil. For a ten year old, whatever a Parish Priest said was akin to Gospel Truth. This little girl didn’t have the inner strength of Bernadette at this time in her life; but keep in mind that Bernadette was older than Lucia at the time of the Apparitions in Lourdes. Also, these little ones were being given a series of the most serious messages Our Lady had ever given the world; therefore, it was understandable that the attacks would be greater. As the time for the July 13 meeting approached, Lucia had decided not to go back to the Cova da Iria. She was convinced she was being assaulted by the devil himself in the form of this beautiful lady. The other two couldn’t understand Lucia’s logic. For them it was impossible that it was anyone other than the Queen of Heaven. So much good was going on at the Cova. It was a contradiction of what satan would have wanted. But they couldn’t budge Lucia. Brave little Jacinta said that if Lucy didn’t go, she would speak to the Lady, though she was frightened out of her mind. My most precious family; this is an exciting and important month for us Catholics, especially those who love Mary. It’s something that could pass you by, because it’s not promoted as much as other things in our Church. That’s why I’m just here to remind you of it, because I love you. Next Tuesday is Mother Mary’s Birthday. Our Lady has given us many gifts during our lifetime. She has been there for us in many ways; she has worn many faces for us. She is our Mother; she is our friend; she is our confidant; she leads us to her Son Jesus. In our book, The Many Faces of Mary, we share with you just some of the miraculous apparitions she has made here on earth. 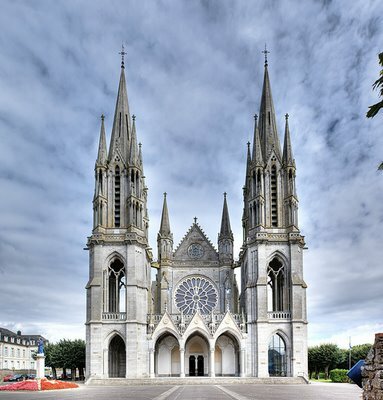 She came to a little illiterate girl in Lourdes, France and proclaimed her Immaculate Conception. From that time until this, she has given us miracles at Lourdes, at the Baths, and at the Blessing of the Sick. “But come to the foot of the Altar. Great graces will be poured out on those who ask for them.” There is a catch. You have to ask for them. Our Lady’s hands had rings on each finger. But rays only beamed down from certain fingers. She said to Catherine Labouré, “the fingers with no rays are graces that have not been asked for.” The gifts are there. You have but to ask for them. It’s so much like the gifts we received at Confirmation, the Seven Gifts of the Holy Spirit. They’re wrapped up like Christmas presents, sitting under the tree. But you have to take them. When Penny and I taught Confirmation Class, we walked around the room with a $5 bill, offering it to the students. Everybody thought it was a trick, and didn’t take it, until one brave soul took it. He said “Thank You.” I said “You’re welcome.” Then everyone in the class was upset that they hadn’t taken the gift. When was the last time any of us used the Gifts of the Holy Spirit? Who even knows what the Seven Gifts are? Go up to the foot of the Altar. Take the gift from Our Lady! Okay. We’re coming to the big climax. I think you’ll agree with me that we were all given tremendous gifts by Our Lady during our lifetime. And she never stops giving. But now it’s time to give back. Next Tuesday, September 8, is Mary’s Birthday. Honor her. Go to Mass. I know it’s not a Holy Day of Obligation, but do it anyway. Don’t let the world get in your way. She is your Mooother. She has given to you. Give to Her. Or She will get you. Just sayin… I’m telling you this because I love you. Mary loves you. Love her back. And FYI, the next day is my birthday. So while you’re at Mass on Mother Mary’s birthday, pray for my special intention. We love you! We have just added many new feature apps to our timeline at Facebook. Go here https://www.facebook.com/bobandpennylord to view our page and be sure to like us. You can access all the new features and apps by clicking the arrow at the top right. Finally, we want to honor Mother Mary in a special way this year. Be sure to click the Special Offer Tab and check out the 50% discount on Many Faces of Mary dvds and books for the Month of May. Or is She speaking to us all! On August 21, 1879, a rainy day to be sure, our Lady came to Knock, Ireland, with St. Joseph, St. John the Evangelist, a Paschal Lamb, and a Heavenly Army of Angels. She appeared at the back of the Knock church, and stayed there, with fourteen visionaries, for a period of about three hours, in the pouring rain. But in all that time, She never said a word to anyone, nor did She even acknowledge their being there, except when one of them got too close, fourteen year old Patrick Hill, at which point our Lady moved back away from the child. During the investigations which followed the apparition of Mary, a great obstacle was the fact that She said nothing. Till today, Knock has never been officially approved by the Church, even though two Popes have visited the Shrine, the most recent being the occasion of the 100th anniversary of the Apparition, August 21, 1979, when Pope John Paul II came as a pilgrim to Knock Shrine, and left Our Lady of Knock a gold rose.. When we first wrote of Knock and our Lady’s Apparition, in our book, The Many Faces of Mary, a love story, we thought She said nothing because She was pleased with Her Irish children and their faithfulness under the worst conditions. We still believe that is true, but only part of the truth. Curiously enough, it was the Angels that made us realize what Mary was actually doing in Knock, Ireland. One night, in New Orleans, while preparing our slides for a lecture tour of that holy state, (that was before we had made videos and DVDs, and programs for EWTN) we saw something in the Apparition at Knock that just snapped us to attention. It was the Angels! 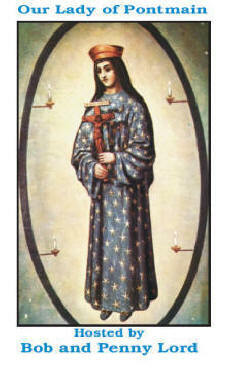 On the right side of the Apparition, there was an Altar with a Lamb and a Cross, surrounded by Angels. The Angels’ wings were fluttering in the Apparition. We had been taught, maybe a month before this time, about St. John Chrysostom, a Doctor of the Church, one of the Early Fathers. St. John said that when the priest extends his hands over the bread and wine at the beginning of the Eucharistic Prayer, he summons down the Holy Spirit! You listen the next time you’re at Mass. The Angels don’t have the power to summon down the Holy Spirit, but our priests, by their ordination and consecrated hands, have been given that power. St. John taught that when the Holy Spirit descends upon the altar, He is accompanied by tens of thousands of Angels, present on the Altar to protect and adore the Eucharist. That was it! That’s what Mary was trying to tell us at Knock, Ireland in 1879. It was the Mass, the Eucharist. She was telling us to defend the Eucharist! Our belief in, and the importance of, the Real Presence of Jesus in the Eucharist, is under such attack today. Then our eyes traveled to the center of the apparition, to St. John, dressed as a Bishop, holding open the Book of the Gospel. The Word; Mary was telling us to defend the Word. The Gospel is so fragile. It’s like a crocheted sweater. If you pull one thread, the whole sweater unravels into a heap. Cast doubt on one part of the Word, and the rest will topple with it. Some people tell us Jesus did not physically resurrect from the dead. It was a spiritual Resurrection. Well, if He didn’t resurrect, as it says crucified, was He really born? And if He was not really born, is there a God? So, you can see how we must defend and protect the Word with our lives. And then, we looked to the left, at Mary and St. Joseph. In the slide we show, a lady was kneeling at the side altar, and had left her infant at the feet of St. Joseph. The Family; we could see the Family. Mary was telling us to defend the Family. Mary was speaking to us loud and clear at Knock. Save the Eucharist, because if you destroy the Eucharist, you destroy the Church! Save the Word, because if you destroy the Word, you destroy the Church! Save the Family, because if you destroy the Family, you destroy the Church, and you destroy the World! Prophecy? Was Mary warning us of things to come? Was the message of Knock for the people of Ireland of 1879, or the people of the world of today? One year, when we were interviewing Fr. Joseph Pio at San Giovanni Rotondo, getting background for our documentary on Padre Pio, he called our Lady of Knock – Our Lady of the Apocalypse! Saint Louis Marie de Montfort said, “in Scripture Mary was silent; but in the last days, She will be like John the Baptist, heralding the coming of Christ. She will no longer be silent.” In this apparition, Mary said nothing, but She said everything. But we did not understand. In Fatima, She warned us, but gave us a way out – “In the end, my Immaculate Heart will triumph.” Too many people took that to mean we didn’t have to move a muscle. Mary was going to take care of everything. Now She is appearing all over the world and She is talking, warning, pleading. But this time, She’s not talking about how She’s going to do it, and how Her Immaculate Heart will triumph. She’s pointing to us. She’s telling us to get up off our duffs, and get the job done! Save the Eucharist; Save the Word; Save the Family; Save the World. And She’s not beyond sending Angels to teach us and direct us, as She did at Knock and Fatima. We really believe we’re at zero hour. These may truly be the end times, the final days. Do we dare not listen and respond? Jesus loves His Mother so much. She, on the other hand, loves us so much; she always comes to us, to help us, to guide us, to plead with us, to plead for us. We have one complaint, however. She picks the most out of the way places to visit us. If it’s not a high mountain place, like La Salette, where you take your life in your hands to get up there, it’s a village in the middle of nowhere, where there are no decent roads as in the instance of Fatima, and no directions, as at Pontmain, France. Pontmain is not even a town, but a village. It’s not on the map. No one in the United States talks about it, because no one knows where it is. Yet, it’s a very special place, very out of the way, but so wonderfully out of the way that it remains untouched. In those days before Google Maps and GPS systems, there was no reason why we were able to find this place, except that Our Lady had determined that she wanted us to go there, so that we could spread her message at Pontmain to the world. Pontmain is a small village on the borderline between the Normandy and Brittany sections of France. It is very small, situated between Fougeres and Mont St. Michel, which is on the Normandy Coast. In the winter, there are cold, howling winds, bringing icy weather to the entire area. The winter of 1871 was such a time. January was an especially brutal time for man and beast. Those who could avoid it did not venture out into the weather. But unfortunately, not everybody could stay at home. France was engaged in a war with the infamous Bismarck, and his mighty Prussian troops. The little people, the common folk, flocked to their churches, to the shrines of the Rue du Bac, La Salette, and Lourdes. They prayed, fearful that it was too little too late, but hopeful, knowing that Our Lady was a merciful Mother, that their prayers would not fall on deaf ears. Rosaries, Stations of the Cross, confessions, fasting, communions, all were offered up to their Heavenly Mother in a desperate plea for help. We can just picture in our mind’s eye, millions of angels carrying all these prayers and offerings up from the earth and laying them at the feet of their Queen. They had to run out of room in Heaven for all the prayers and petitions offered up. At one point, Mary’s beautiful eyes might have looked out over the land she had tried so hard to protect, that she had loved so much. We can imagine a sadness coming over her sparkling eyes. Perhaps a tear slipped down her velvety cheek, and descended to the earth; when it landed, an explosion of energy lit up the entire sky. It happened on January 11, 1871. Scientists called it an Aurora Borealis. The faithful called it Mary to the Rescue. Many of the young men of Pontmain had answered the call to duty. They were somewhere in the war zone, but no one knew where, or how they were. Stories of the massacres the French were suffering at the hands of their enemies, found their way back to the town. In addition, the Prussian troops had gotten to Laval, a town extremely close to Pontmain. On the evening of January 17, the men of the Barbedette family were working in their barn. Dinner would be ready soon, but they wanted to get finished with their chores before going inside. It had begun to snow lightly, not like the other days. The winds had died down. The pure white powder fell gently, as if it had come directly from Heaven. Monsieur Barbedette, known as Bierot, his sons Eugene 12 years old, and Joseph, aged 10, were all working side by side. It was about 6 in the evening. In the recesses of their minds was concern over the third Barbedette son, Auguste, who was away fighting the war. The father felt that by working, he could take his mind off his fears; but it was not happening. Not an especially religious man, he found himself praying his rosary under his breath. A neighbor woman, Jean Detais, came by with rumors about the war situation, and possible news about the son Auguste. Eugene could not get over how gently the snow had fallen outside. He couldn’t hear a sound. There was not the slightest breeze blowing, much less the Gail storm winds that had buffeted the area earlier that day. He walked to the door of the barn. He didn’t want to hear any bad news about Auguste. He thought that by walking away from it, by not listening to Jean Detais, he could prevent it from happening. The night cold air was refreshing. He looked outside. The snow had stopped. He remarked to himself how unusual it was that the sky was so full of stars, though there was no moon that night. He looked around him. He was immediately frozen to the spot. Above neighbor Augustin Guidecog’s house, about twenty five feet in the air, a beautiful lady was suspended in the air, her arms outstretched. She was looking at him, and smiling. He had never seen anything like her in his life. Her eyes gleamed like stars. Her teeth were pearl white. They sparkled as she smiled at him. To the 12 year old Eugene, she was a lady, but she appeared to be about 18 to 20 years old. She wore blue, but dark blue, darker than the sky. Her dress was long and loose; her sleeves flowed, and on her collar was a band of gold. There was a black veil on her head, topped by a gold cap which resembled a crown. A thin red band ran across the cap. She wore blue slippers tied with gold ribbons. The neighbor woman noticed the boy standing in a daze at the door. He was staring up into the sky. She went over to him to see what the matter was. He asked her to look up in the sky and tell him what she saw. “I see nothing.” she answered. Eugene looked at her incredulously. How could she not see a lady suspended in air. It was the most unusual sight he had ever seen, and she couldn’t see it. He called his father and brother to look up at the sky. Bierot could not see anything, but young Joseph’s expression turned to joy as he looked up above Guidecog’s barn. “I see a beautiful lady”. he exclaimed. He proceeded to describe the scene in detail, just as Eugene had seen it. The father, Bierot, ordered the boys back into the barn to finish their work. He told Jean Detais, the neighbor, not to mention what they had said to anyone. She promised that she would not. The boys returned to the barn. Bierot took one last look before he closed the barn door. What could it be that they had seen? There was nothing unusual in the sky. The stars were brighter than he remembered seeing them before, but that was probably because the wind had blown all the clouds away. The spark of a thought kept gnawing away at the back of his mind. He had been working with the boys all day. Their behavior had been normal. They hadn’t acted silly. As a matter of fact, there had been a serious tone to the day. They were all worried about the well-being of Auguste. It would have been out of character for them to take a sudden turn to silliness, as he had first attributed their claim about a lady in the sky. Then, he thought, they didn’t see the lady at the same time. First Eugene saw her, and then Joseph. They both described her in the same way. Bierot took one last look in the sky, shrugged his shoulder, and went back to work. The boys could not get the beautiful lady out of their minds. Her gaze warmed them, as if she had covered them with her mantle. The eyes, those cobalt blue eyes that pierced them, the sparkling teeth, the delicate features of her face, formed an indelible impression on their mind. They worked quickly, which was not like them at all. When they had finished their work, they raced each other to the barn door. They pushed it open, and looked out. She was still there. She was still smiling at them. She was radiant. Bierot called his wife; maybe she would see something. This was driving him crazy. Mrs. Barbedette came to the barn door. She looked up, but saw nothing. Her husband was somewhat relieved. However, as a precaution, just in case it was a vision from Heaven, they all knelt down to say five Pater Nosters and five Ave Marias. Then they went into the house for supper. The boys wolfed their food down, so that they could run back outside to see if the Lady was still there. As soon as the last mouthful had been finished, they ran outside the door again. She was still there. The mother asked them to describe how tall she was. This gave the mother an inspiration. She called the nun, asked her to look up into the sky, to see if she could see anything. Sr. Vitaline could not. The boys were becoming frustrated. Everyone agreed that they could see three bright stars, which they had never seen before, and never saw again, except for that night. No one but Eugene and Joseph could see the lady. Mrs. Barbedette had heard the stories which had made their way up from the south of France about the two children from La Salette, and the little girl at Lourdes, who had claimed to have seen the Blessed Virgin. Perhaps this was the same, and only children could see the apparition. She took the nun with her, and together, they went back to Sr. Vitaline’s school. There were three children there. The nun asked them to come along with her and Mrs. Barbedette, to see if they could make out anything unusual in the sky. As they walked towards the home of the Barbedette’s, one of the children, Francoise Richer, age 11, pointed up into the sky. “There’s something very bright above Monsieur Guidecog’s barn”, she exclaimed. Mrs. Barbedette and the nun looked at each other. As they got closer, both Francoise and a younger girl, Jean-Marie Lebosse, age 9, cried out, “Oh, the beautiful lady, with the blue dress and the golden stars”. No one had said anything to these two. They had no idea of what they were supposed to be looking for. They had not spoken to the Barbedette boys as yet. But they saw the same thing that Eugene and Joseph had seen. The third child, however, saw nothing. Word of the event spread through the little village rapidly. Soon, just about every resident of Pontmain was at the Barbedette barn, looking up into the clear winter sky, praying for a glimpse of the Lady. She became enclosed in a blue, almond shaped frame, from which protruded four candles, two at the level of her neck, and two at the level of her knees. On her heart, a tiny red cross appeared. The gathering took on the semblance of organization as the local priest, Fr. Guerin came upon the scene. The children reported that the expression on the face of the Lady had fallen into sadness. The priest ordered everyone on their knees in prayer. They began to recite the Rosary, the favorite prayer of Mary. The first of 5 changes began to take place. As she listened to the earnest prayers of the people for peace, and for the safe return of their children, the visionaries saw her begin to swell in size. She grew to almost double her original size. The triangle of stars grew with her, but the rest of the stars made way for the magnificent visitor, queen of all the stars in the heavens. Some of the stars became enmeshed in her gown, while others positioned themselves at her feet. A Sister Marie-Edouard, who was well known as a leader, began to lead the people in singing the Magnificat. The children shouted out as a new development took place. A banner formed at the feet of the Lady, between her and the top of the barn. It was about the size of the roof of the barn, and as they sang, a word was formed on the top of the banner. It was MAIS, which means “BUT”. As the hymn came to the end, the sentence was formed. The children called out the sentence as it appeared. A shout of joy was sounded among the people. They began to pray the Litany of Mary. Another sentence appeared. As the children read out this sentence, the people began to weep tears of joy. It is Mary. She’s there to help them. Praise Jesus! He allowed her to come again. As the assemblage wept and praised God and His magnificent mother, the Lady began laughing. The children shouted, “Look, she’s laughing…..Look, she’s laughing! !” Soon, the people were affected by the laughter of the Lady. Everyone laughed with her. It stayed like this until they began to sing the Salve Regina, at which point the next two words were formed. At the very end of the Salve Regina, the last word of the sentence was formed. In a small village in the middle of nowhere, at the very darkest hour, Mary, the giving Mary, the loving Mary, began a precedent which has stayed with us from that time until this. We can change His mind through His Mother. Tribulation and chastisement can be lessened, minimized, and very possibly done away with, through the intercession of the beautiful Lady who was given to us at the foot of the Cross. At a given point, the group began to pray the evening prayers. It was about 8:30 at night. A large white veil appeared at the feet of Our Lady. Slowly, it ascended, covering her as it climbed up. Within a short time, it covered all of her except her face. It stopped for a beat, as she looked down at her children with so much love. Then it moved up over her face. to her crown, where it stopped. The crown could be seen for a moment, and then, it, too, vanished. It was 9 o’clock. She had been with them for three hours. given; the order was executed. The troops left the area. Within ten days, the war was over. An armistice was signed. All the soldiers from the little village of Pontmain were returned unharmed. The swift action of the Lord in honor of the request of His Mother, was realized. You are currently browsing the archives for the Apparitions of Mary category.